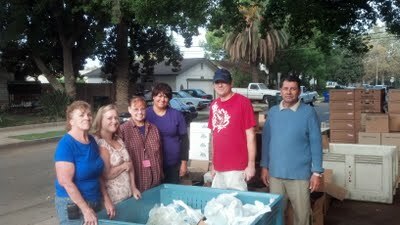 Had a great day out in Chowchilla, we were able to give out 435 boxes to the community. We could not do it without the ccommitmentof the volunteers both from Madera and Chowchilla which totaled over 30 people to help serve the community. I am very proud of them and very excited to see what this CAP program provides. Madera County Food Bank partners up with Foodlink out of Sacramento and gives away a trucklload full of food once a month at a destination chosen by the Madera Food Bank from April to November. November we will be giving it away at McNalley Park in Madera at 9am. Thank you to all our Volunteers!